The new and improved version of BlueTipz has arrived! 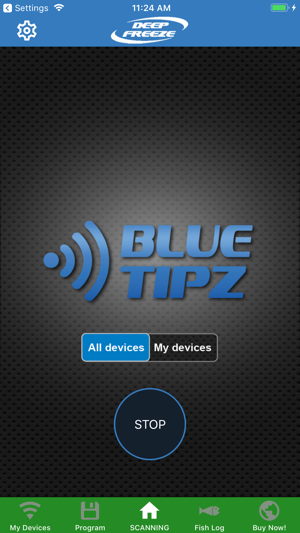 BlueTipz by Deep Freeze is the first tip-up alert system sent straight to your smartphone (iPads, iPods, the BlueTipz Receiver, and other mobile devices can also work). 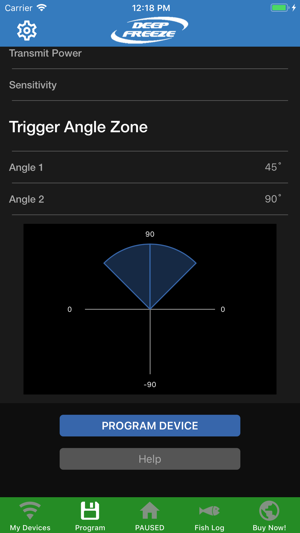 When your tip-up is struck, if equipped with a BlueTipz Transmitter, your phone will be alerted. The user has the option to open scan for all BlueTipz Transmitters, or they can just scan for their own. You can also name your transmitters which allows you to know which tip-up has been struck. A Fish Log enables you to store information about your catch, take a picture, and even post to Facebook! 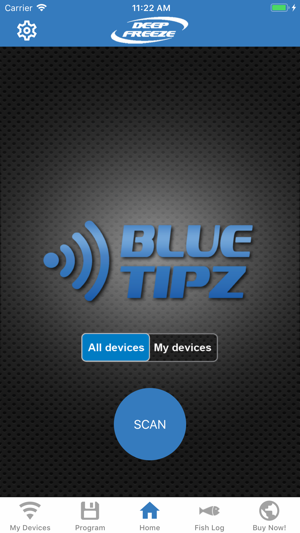 To verify your mobile device is compatible, download the most current version BlueTipz mobile app. See DeepFreezeFishing.com for more detailed information. Any questions can be sent to Info@DeepFreezeFishing.com. This new version introduces the ability to program the blue tips 5.0 transmitters! Works well, definitely worth it! These are very nice products. They are very helpful when fishing inside a shack so you don’t have to constantly be standing up and looking outside the window. I would agree with previous reviews stating they don’t work quite as far as advertised when you was inside a shack. My experience is you can get 50 to 60 yards away from a hard sided shack and still be confident they will work and a bit farther in a soft sided shack. If you purchased the receiver and set it in the window it definitely helps with distance. I’ve noticed the receiver will alert before your phone will alert you. Overall I would say they have been worth the purchase for me as it easy to get focused on the flasher or conversation inside the shack and lose focus on the tip-ups. I gave it a four-star instead of five based on the distance issue when used inside the shack and the price. Used a buddies a couple times before getting my own. They don't reach quite as far as advertised unless you're sitting out in the open with nothing between the sensor and your phone, meaning not in your pocket or inside your shack. I have two tip ups out while jigging and can get distracted watching the flasher for a couple minutes without checking flags in the shack, this alerts you and can get you on a fish before it drops the bait if you don't see the flag go up in the first minute or two. Works well for me as my tip ups are usually within 40-50 yds. While sitting in any kind of pop up/flip style shack best range that still works is around 80-90yds, which is still great. 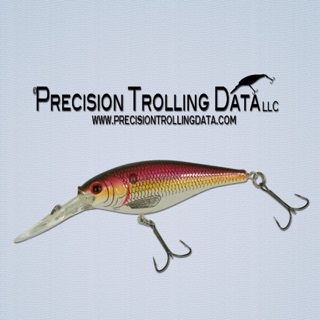 The makers of this app and it's products are poised to make some good money on this as it's the first of its kind. App is very basic and could use some more options. Such as there are only a few notification sounds to choose from. So far I haven't figured out how to get my phone to alert me with a sound while in standby. Currently it just provides a banner with the alert and no sound. Disappointing if I have to have the app continuously open to get an audio alert. Range on the transmitters seem good, but I have yet to field test them. Only messing around the house so far. Setup is very easy. One could easily pick these up on the way to the lake, spend 5 mins playing with them in the parking lot be able to use them that same day. I look forward to seeing what this company can do with updates for this app in the coming weeks. I will repost if anything improves or declines.